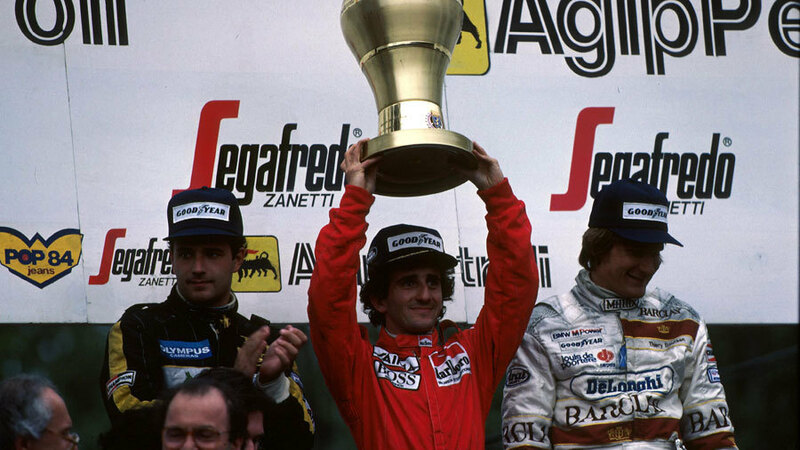 Alain Prost crossed the line first at the San Marino Grand Prix but his celebrations were short-lived as his car was found to be underweight and he was disqualified, handing Elio de Angelis the second and final victory of his 108-race career. While the crowd at Imola were treated to an entertaining spectacle, the drivers were far from happy in a race where fuel consumption was the overriding concern. Five cars ran out of petrol in the closing laps, while Prost spluttered to a halt soon after he crossed the line and he had to hitch a ride back on Patrick Tambay's Renault. The attention immediately before race day surrounded the weather after 24 hours of torrential rain. Niki Lauda made clear on behalf of the drivers they would not tolerate a repeat of the appalling conditions they had been forced to race in at the Portuguese Grand Prix a fortnight earlier. Ayrton Senna qualified on pole for the second race running and by the end of the first lap his Lotus team-mate de Angelis had passed Keke Rosberg to move second, but he was struggling to keep up with the leader. By the tenth lap de Angelis' hard driving had taken a toll and his brakes began to fade, allowing Michele Alboreto (Ferrari) and Alain Prost (McLaren) past. Championship leader Alboreto retired with brake issues on the 23rd lap but his new team-mate Stefan Johansson was impressing with a drive that took him from 15th to fifth. The fuel he used in a furious battle for third with de Angelis proved his undoing. At the front, Senna and Prost swapped places in a gripping tussle but again it took its toll on their fuel and as the race neared a conclusion both were forced to ease off. Eight laps from the end Johansson finally passed de Angelis and closed rapidly on a slowing Prost, overtaking him on the 54th of 60 laps. Three laps later he moved into the lead as Senna ran out of fuel but his lead lasted less than a complete circuit as he suffered the same fate. That put Prost back in the lead from de Angelis as both men nursed the last drops of fuel from their tanks. By the end de Angelis was almost brakeless and one of his rear tyres was all but spent. Then came the post-race drama. Prost's car was found to be two kilos below the minimum weight limit and so he was disqualified. He was excluded giving Lotus a second win in a row. Thierry Boutsen was promoted to second with Tambay moved up to third. Johansson's day was not quite over, either. Although he was officially classified as sixth, he was also disqualified because his car was not brought for post-race scrutinisation within the one-hour limit. This was overturned on appeal. Nigel Mansell, who brought his Williams home in seventh, was not happy, and later moaned the race was less about racing than fuel consumption.